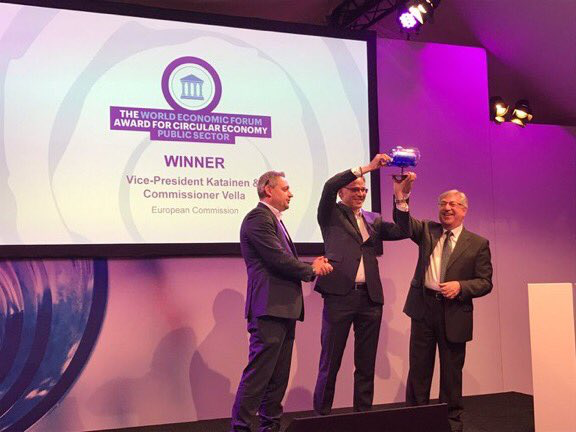 21 january 2019 in Davos, the European Commission was awarded the 2019 Circular Economy prize by the World Economic Forum and the Forum of Young Global Leaders as recognition of the work done to accelerate the transition towards a circular economy that protects the environment and reduces greenhouse gas emissions while delivering opportunities for jobs, growth and investment. In 2015, the Commission established a unique comprehensive strategy, the Circular Economy Package, aiming to close the resource loop by introducing measures covering the whole lifecycle of products and materials – from production and consumption to management of waste and its re-use as secondary raw materials in the economy. The suggested measures also tackle climate change with energy savings and reduced greenhouse gas emissions, and include the first-ever European Strategy for Plastics. The Commission has delivered more than 90% of the 54 planned actions. A circular economy is part of the modernisation and transformation needed for the EU to become the world's first major economy to go climate neutral by 2050, as per the long-term strategy put forward by the Commission in November 2018. Furthermore, the Commission is currently reflecting on which steps are now needed to make Europe ever more sustainable.